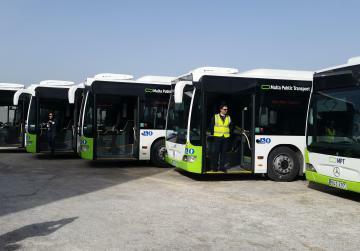 Malta Public Transport said this afternoon there will not be any service disruptions on Monday. It said that although the sub-contracting agreement with Unscheduled Bus Service (UBS) came to an end this weekend, alternative sub-contracting arrangements had already been put into place until all 32 newly leased buses are put into service over the next four weeks. UBS said earlier today its buses would not be on the road as part of the public transport service as from tomorrow. It said in a statement this morning that its contract expired today and was not going to be renewed, in spite of a great shortage of buses. The UBS said it worked hand in hand with the buses to provide buses, primarily low floor, to make up for the Arriva shortage. It continued to provide a service when Autobuses de Leon took over on January 8 on the understanding that the new operator had to receive second hand buses from the UK by today. These vehicles did not arrive and the UBS was requested to continue providing a service. However, the conditions were not agreed upon. The UBS said it had done its utmost to serve the public and its members even bought a large number of low floor buses to be more accessible. It thanked the public for their cooperation during the provision of its emergency service and hoped the new operator would implement its obligations according to its contract as promised and in line to what the Maltese people deserved. Meanwhile, Autobuses de Leon this morning took delivery of the first five buses out of 32 that would form the temporary fleet until the new fleet starts arriving towards summer. More buses are expected to arrive in the coming days. The company would gradually increase to fleet to around 360 over the contract period. Autobuses de Leon chairman, Felipe Cosmen told a media conference this morning that the 12-metre buses were equipped with Euro5 engines and an upgraded airconditioning system. He said the buses had two doors, one in the front for boarding passengers and one at the back for alighting passengers. This, he said, was expected to improve the overall journey times. Asked about drivers, Mr Cosmen said the recruiting process was underway and would continue. Around 70 drivers were currently receiving training. By the end of the year the company expected to have 200 new drivers. Priority was being given to local people who knew the roads but the company did not exclude turning to foreigners if the need arose.